In a somewhat surprising move, the Calgary Flames added another piece to an already stacked top-four blue line when they re-signed defenseman Michael Stone to a three-year contract extension on Friday. Even after adding Travis Hamonic by trade, general manager Brad Treliving didn’t settle and now has a top-five that will rival any blue corps in the NHL. Michael Stone agrees to terms in CGY, three years with an AAV of $3.5M. Stone’s contract comes in at an annual salary of $3.5 million. It’s a potentially hefty price to pay for a defender not in the top-four but it still gives the Flames almost $10 million in cap space to look after at least three forward spots that need to be filled. Among those will be winger Sam Bennett. With Hamonic in the fold, there was some speculation that Stone might be the odd man out. Instead, the 27-year-old, stay-at-home defender chose not to take his chances in free agency and decided to remain with the Flames. The Flames also elected to roll with the player they knew. Stone will slot into the five-hole on the blue line and is good for 18 to 20 minutes per game. Ideally, the Flames will keep him on the lower end of those numbers, moving him up in the event of injury. For the Flames last season, Stone played 19 games and had two goals and six points. He’s not meant to provide a lot of offense, but he was able to contribute and he became a player Treliving new was worth another look heading into the 2017-18 season — especially if his analytics numbers improve. He’s a veteran of seven seasons with at least five of them including 64 games or more played. 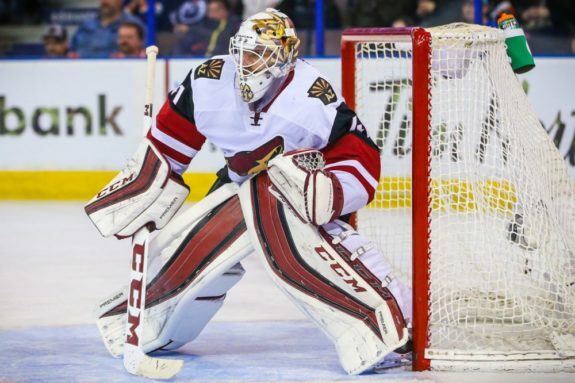 The Flames made trades for goaltenders Mike Smith and Eddie Lack. Both are proven starters and backups respectively and both come in with reasonable salaries. The Arizona Coyotes retaining 25 percent of Smith’s cap hit and the Carolina Hurricanes agreeing to cover fifty percent of Lack’s is a huge plus for the Flames who wanted financial flexibility. Smartly, Treliving also says he’ll be keeping an eye on the free agent market but wants to see how the market goes before jumping in. There is some speculation that the Flames have their eyes on forward Patrick Sharp, but that may depend on the asking price. All signs suggest the Flames will look internally first and add depth pieces later. One thing to note that may be forgotten in all of this; by re-signing Stone, the Flames have forfeited their 2018 fifth round pick to the Arizona Coyotes.